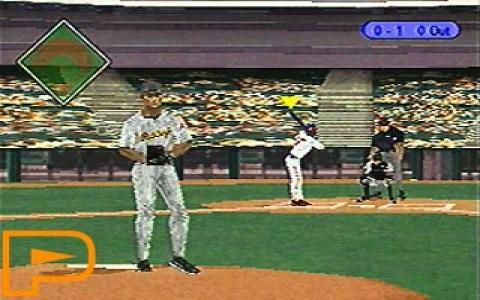 Triple Play is a series that made baseball popular as a virtual simulated game, and it managed it by sharpening the graphics, reducing the complexity of the control scheme, and keeping the fun factor just in line to keep you wanting more. I guess, as fast food restaurants have discovered, blander foods are better because they can be eaten in larger quantities, so, maybe Dice Multi Media Europe B.V. had the same approach. Now, don't get me wrong, I do appreciate baseball in real life, as a spectator sport so my reserved approach is not caused by not being a fan of the game: it is more about this simulation being a bit narrow-minded, a bit too conceptually sound, but unimpressive. This derives from the clean but ultimately bland implementation of the game's sequences. Each one is treated as a minigames, and these portions don't really overlap, making the metagame, the game of baseball, a little to sterile for my taste. But even so, I still kept playing it for quite a bit, which goes to show that the game has the drawing and staying power to keep you interested. So, fans of baseball can definitely give it a go, though later releases will improve the recipe both graphically as well as gameplay wise.